This is the first issue of the fourth volume (Vol IV, no. 1). The volumes run from April to March. In this issue, there are two plates and two pages of description. Plate one features figures 134 and 135 and is labelled "Hyde Park. Morning Dress." Plate 1 is shown below in color. Plate 2 features figures 136-7 and is shown below in greyscale. It is labelled "Concert Room. Evening Dresses." Morning Dresses. These ladies have gone out on a windy morning for a walk. They have on bonnets and shawls over their morning dresses, and one carries a fur muff. 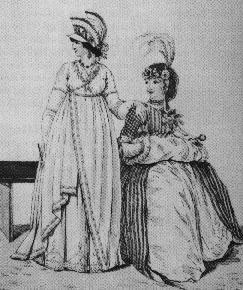 The glimpses of ankle in this plate made it "titillating" to the 1797 audience. Note how boldly the bonnets and dresses contrast in color. It always strikes me as odd how fashion plates often features hats and dresses together than seem to be designed without much color coordination. Concert Room, Evening Dresses. The dress on the left is in the Greek mode, with the headdress resembling a helmet. The draping is supposed to imitate a toga. The seated lady has a monocle attached to a ribbon, a common accessory of the period. Her muff has the fur on the inside and only showing at the edges. A corsage is pinned to her printed overdress. Her headdress is made of a net attached to a band trimmed with a ribbon rosette and some feathers.